I really like this v-book! 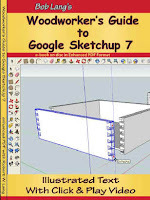 Something all skill levels of sketchup can learn from! I tried SketchUp & got aggravated at my own slow learning process. I like Bob's stuff and intend to give this one a try. Dave, thanks for you opinion! Eric, I did the same thing and tried to figure it out on my own, got frustrated, and quit. I think you'll find that Bob's book demystifies the program and you'll pick it up much more quickly. I have used Sketchup a bunch and love it. In fact, I have also rendered some of my designs into photo quality images. A few I have uploaded to stock photography sites and actually sold. If you are interested in seeing the potential of what one can do in Sketchup. I have a love/hate relationship with Sketchup. I don't use it enough to be proficient at it. (translation, I forget what I learned the last time I used it:) I think I spend more time in the help guide that working on the drawing. But... when I want to check proportions on a piece,for example a table. It is easy to make changes to see if a wider/narrower leg would fit, without have to redraw the whole project. I'll check out the e-book. I just ordered it. Thanks for the recco, Kari. 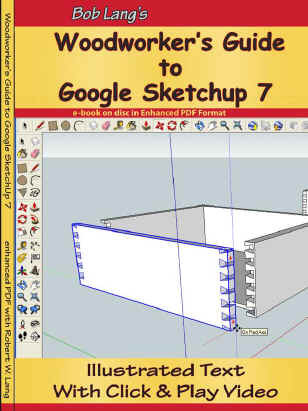 Wow, Brian, you took SketchUp to a whole new level. Well done! Keith, Bob's book should make a good reference for when you get stumped. I'm brand new to SketchUp, but it sounds like any software program: the more you use it, the faster you get. I just got the book and found a bug, the videos won't play, instead I get a "find media player" popup. I have tried the disk on 3 different computers, all with windows media player installed and the same thing happens with all three. There seems no way around this and there is nothing in the book's documentation about this problem. Anyone have a solution? I am sure he will be happy to help you. Sounds like it's a problem with that particular copy. Sorry I didn't catch this until now. Some users of Windows 7 have reported this error message from Adobe Reader. The fix is to use QuickTime as the media player in Adobe Reader. The videos are MP4s embedded in the PDF, and in theory this format would work with any OS and media player combination. Apparently, the latest version of Reader and the latest version of Windows haven't learned to play nice with each other. Any other issues or comments? My contact information is at the bottom of each page on the website.